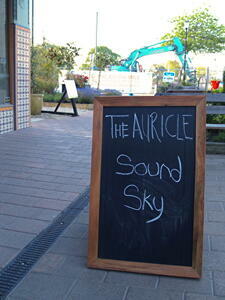 A photograph of a blackboard outside The Auricle Sonic Arts Gallery on New Regent Street, advertising the opening of an exhibition of stories, sounds and speculative futures for Christchurch. The exhibition was presented by Sound Sky - a geo-located audioscape and mobile phone app - as part of FESTA 2014. 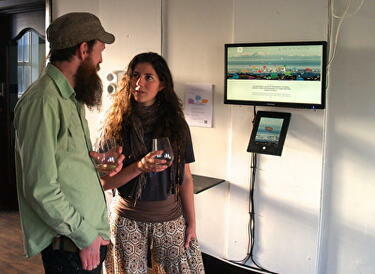 A photograph of two people at The Auricle Sonic Arts Gallery on New Regent Street, during the Sound Sky exhibition. The exhibition was part of FESTA 2014, and presented layers of stories, sounds and speculative futures for Christchurch. 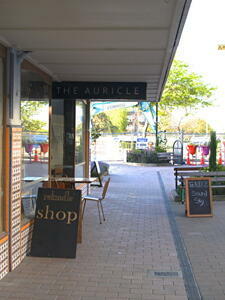 A photograph of The Auricle Sonic Arts Gallery before the opening of an exhibition of stories, sounds and speculative futures for Christchurch. The exhibition was presented by Sound Sky - a geo-located audioscape and mobile phone app - as part of FESTA 2014. A photograph of a computer monitor and tablet mounted to the wall at The Auricle Sonic Arts Gallery, during the Sound Sky exhibition. 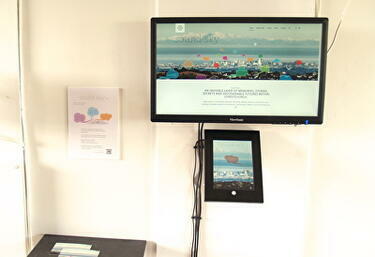 The exhibition was part of FESTA 2014, and presented layers of stories, sounds and speculative futures for Christchurch. 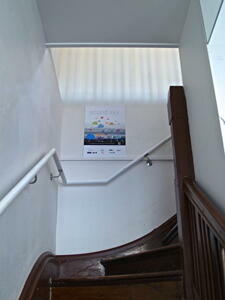 A photograph of a poster above the staircase at The Auricle Sonic Arts Gallery on New Regent Street. The poster is advertising the Sound Sky exhibition. The exhibition was part of FESTA 2014, and presented layers of stories, sounds and speculative futures for Christchurch.